My run in Essaouira, Morocco had quite a nice mix. I started off in the medina(the historic non-european part of north-African towns) where I promptly got lost, eventually made my way to the city wall and ran along that until I found the beach. 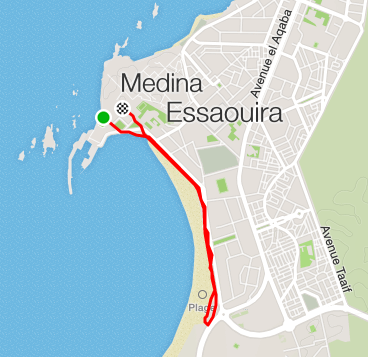 Unfortunately my GPS tracker was oblivious to my run in the medina(I think it has more trouble navigating in there than I do), so the run is recorded as a kilometre shorter than it was in actuality. Despite the confusion, it was a very enjoyable run. Essaouira is on the coast, and has a much more tolerable temperature than our previous stop, Marrakech. We had just arrived after a 3-hour bus ride from the 40C Marrakech, and the 25C afternoons of Essaouira were a welcome change. The vibe in Essaouira is also much more relaxed than in Marrakech, while people are trying to sell you things, they aren’t shouting at you every five paces to get your attention. It was fun dodging around the medina, and getting weird looks(and occasional offers of drugs) from the locals, and on the run down the beach I got to see kite surfers and camels – a definite plus. It was amazing to get back to the hills – I’m acutely aware it’s prime hiking season in Vancouver! 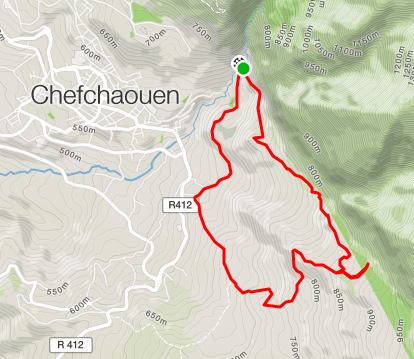 Chefchaouen was just the thing to sate my need for the mountains.